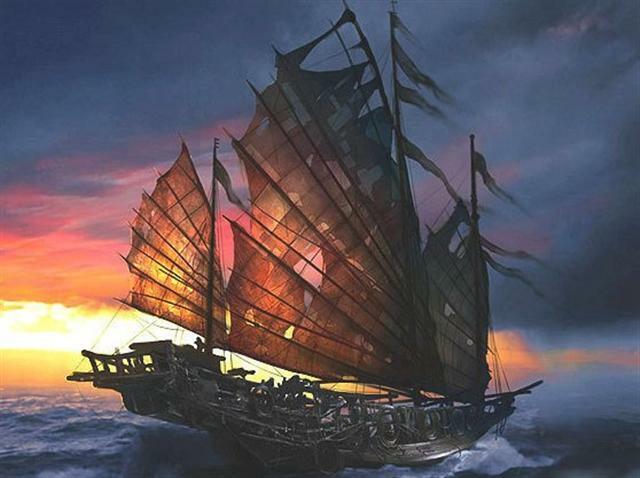 The Pirate ship Empress is a Chinese warship with a crew of supernatural Chinese pirates. The Ship is captained by Pirate Captain Sao Feng, Lord of the South China Sea.The ship has red sails and has a greenish coloured deck. Pirates of the Caribbean: At World's End is a 2007 adventure film, the third in the Pirates of the Caribbean films following The Curse of the Black Pearl (2003) and Dead Man's Chest (2006). At World's End is helmed by Gore Verbinski, director of the previous films, and the cast includes returnees Johnny Depp, Orlando Bloom, Keira Knightley, Bill Nighy, Geoffrey Rush, Jack Davenport, Tom Hollander and Naomie Harris. Chow Yun-Fat makes his first appearance in the franchise as Sao Feng, one of the film's antagonists, as does Keith Richards as Jack Sparrow's father. Fgntr 1. 8" ghor jvgu gernfher znc/pbbeqf va perivpr. Svany 30 pny nzzb obk, ghpxrq.